Look out, REBELS! 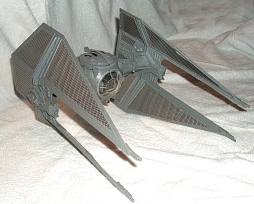 Here comes one of THE EMPIRE's fastest fighter vehicles. This authentically designed TIE INTERCEPTOR has a hatch that opens to hold an IMPERIAL STORMTROOPER or any other Action Figure from the STAR WARS RETURN OF THE JEDI collection. Realistic battle-action features include battery-operated laser cannon and sound. Press a button to eject the wings and simulate battle damage. 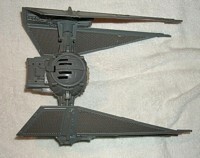 The TIE Interceptor was part of the last line of ships that Kenner produced in ROJ packaging. Along with the other late Jedi releases, the Imperial Shuttle and B-Wing Fighter, this vehicle is one of the harder ships to find today. 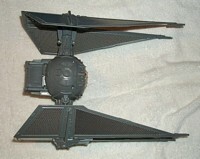 The Interceptor was the last of three ships that Kenner based on the original TIE Fighter. 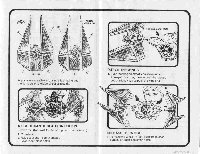 Aside from the Interceptor, the other TIEs Original, Darth Vader's, Battle Damaged) share a common molding for their center section and wing extensions. The Interceptor's center section is identical to the earlier moldings but the wings were improved. One of the major problems with the design of Darth Vader's TIE was in using a two-piece wing. Because of the angled wing, the extension is stressed along its top locking pieces when the ship is resting on its wings. (This leads to weakening or rounding of the tabs.) On the Interceptor, the extensions were redesigned as part of the wing itself, leading to a much stronger assembly.